Since their introduction 12 years ago, intravitreal anti-vascular endothelial growth factor (VEGF) drugs have gradually become the standard of care for several prevalent and debilitating retinal eye diseases. The anti-VEGF treatment is given by an injection into the eye. In a ground-breaking project, clinicians, researchers and pharmacists at Oslo University Hospital (OUH) and University of Oslo (UiO) have collaborated to improve the safety, efficacy and economy of the anti-VEGF procedure, which in 2017 was performed about 23.000 times at OUH alone. The results are likely to impact practices across Norway and also internationally. Until recently, syringes for intravitreal injection have been prepared in the operating room by the clinicians. The retinal consultants Øystein Kalsnes Jørstad, Magne Sand Sivertsen and Morten C. Moe at the Department of Ophthalmology, OUH/UiO, realized that this practice could be improved. They contacted Dag Fossum at the Hospital Pharmacy, and together they set up a novel procedure at the Pharmacy’s sterile production facility for pharmaceutical compounding of prefilled syringes ready for injection. This practice has several advantages: 1) Sterile production reduces the risk of contamination and thus the risk of bacterial endophthalmitis – a rare but devastating complication of intravitreal injections; 2) The whole content of the drug vials are used, which reduced waste of very costly drugs; 3) Less time spent per injection, improving efficiency in the injection room and increasing the focus on the patient rather than on drug preparation. However, a major obstacle remained; there were no data available on the quality or stability during storage of prefilled syringes for the most commonly used anti-VEGF drug, aflibercept. As a result, the Department of Ophthalmology had to discard all unused syringes after 24 hours storage. The eye department therefore contacted Jan Terje Andersen at the Department of Immunology and Transfusion Medicine and Department of Pharmacology at OUH/UiO. His research group, including Post Doc Stian Foss and PhD student Algirdas Grevys, is recognized internationally for their research on structural and functional analysis and improvement of therapeutic antibodies. Together, the team set up a broad test panel assessing the quality and stability of prefilled aflibercept syringes. The results proved that the syringes could be stored for more than 1 week after production without losing biological activity. The results are now published in Scientific Reports, an open access journal in the Nature-family. In addition to saving the health care sector significant drug-expenses in the range of 40 million NOK per year for OUH alone, the results also opens up for transport of prefilled syringes to eye clinics without such facilities. The novel method established at OUH has already gained considerable national attention. It has become the “golden standard” in most eye departments in Norway, and is now recommended by Norwegian health authorities. Eye departments in several Nordic countries have also contacted OUH. Finally, the new practice may have consequences for the use of a wide range of other antibody-based drugs. 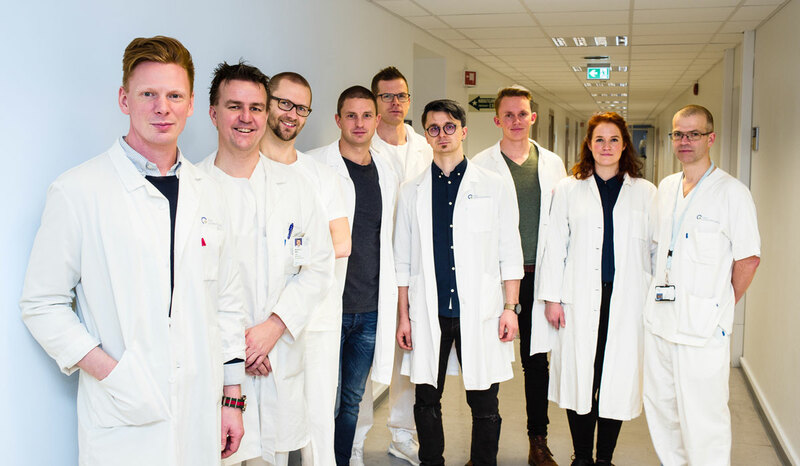 This fruitful team-up of clinicians and researchers at OUH/UiO will now seek to improve the half-life and bioavailability of biologics inside the human eye, for future clinical use. The Eye-team. From left: Jan Terje Andersen, Morten Carstens Moe, Øystein Karlsnes Jørstad, Stian Foss, Magne Sand Sivertsen, Algirdas Grevys, Torleif Tollefsrud Gjølberg, Heidrun Elisabeth Lode og Espen Gleditsch (Syekusapoteket). Foto taken by UiO/Øystein H. Horgmo. Pharmaceutical compounding of aflibercept in prefilled syringes does not affect structural integrity, stability or VEGF and Fc binding properties. Magne Sand Sivertsen, Øystein Kalsnes Jørstad, Algirdas Grevys, Stian Foss, Morten Carstens Moe and Jan Terje Andersen. Scientifc Reports, 2018 Feb 1;8(1):2101.